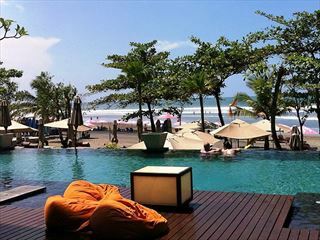 Fronting a huge expanse of beach, The Legian is one of the best Bali resort experiences along the chic Seminyak strip on Bali’s southeast coast. There are 67 suites in a range of designs. There’s also a Club Lounge and butler service. 67 suites offer guests the finer pleasures of resort living, with spacious bedrooms, bathrooms, separate living areas and private balconies. 15 Studio Suites (99m2) with spacious bedrooms, bathrooms, separate living areas and private balconies and a pantry for added convenience. 7 Superior Suites (110m2) with spacious bedrooms, bathrooms, separate living areas and private balconies with well-appointed dining areas for stylish in-suite entertaining. 30 Deluxe Suites (110m2) with spacious bedrooms, bathrooms, separate living areas and private balconies with well-appointed dining areas for stylish in-suite entertaining. 13 Two-bedroom Suites(155m2) features spacious sitting rooms and dining areas. All bedrooms have individual en-suite bathrooms, which make this suite type ideal for families and small groups travelling together. 1 The Seminyak (274 sqm) & 1 Legian Suites (364 sqm) offer guests the ultimate luxury resort experience, each suite comprises two luxurious bedrooms with double balconies and spacious living areas. 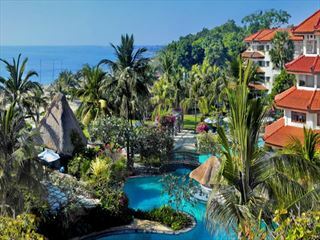 The Legian Suite boasts a magnificent terrace that overlooks the pool and ocean. Guests staying at The Seminyak or The Legian enjoy the services of a personal butler and a private car with driver on request. Additional en-suite amenities include the latest BOSE hi-fi system and VCD/CD players. The Restaurant - A spacious bistro that opens out onto the terrace. The Restaurant serves healthy breakfasts, light lunches, and modern European cuisine with Asian influence for dinner. An ample wine list and sommelier’s selection of by the glass completes the dining experience. Intimate Dining Affair - Indulge in a tailor made five-course gourmet dinner with an exquisite bottle of wine or champagne, in a secluded Balinese pavilion that overlooks the picturesque Indian Ocean. The Lobby Lounge & Bar - Live piano music fills the air in the relaxed and friendly atmosphere of The Lobby Lounge and Bar. Adding a touch of vibrancy to Seminyak, this charming venue is ideal for pre and post dinner tete-a-tetes. On offer are a fine selection of wines, cognacs, whiskies, liqueurs and cigars. For cigar aficionados, the signature "Legian Cigar" comes highly recommended. 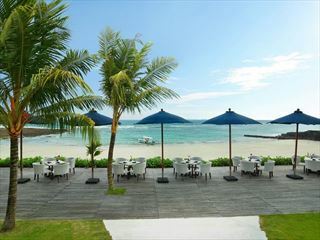 The Pool Bar - Strategically located by the pool and beach, The Poolbar offers light entres for breakfast and lunch. This delightful venue also serves refreshing cocktails throughout the day, and presents a magnificent vantage point for taking in the splendour of a Balinese sunset. In-Room Dining - Room service is available 24 hours a day.